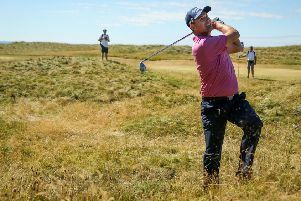 Graeme McDowell admitted The Glashedy Links at Ballyliffin Golf Club had proven a bigger test than some may have anticipated for this year’s Dubai Duty Free Irish Open Championship. McDowell safely negotiated his way into this morning’s third round with a one-over par round yesterday to leave him level par for the tournament being staged in Co Donegal. The Portrush man had earlier in the week predicted that a score of minus-20 could be recorded over the weekend. However, it has proven a bigger test than some may have thought with minus-eight the clubhouse lead after two rounds. In our interview McDowell acknowledges the course was tougher than anticipated.